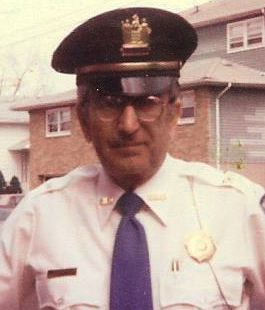 Emil Yannetti | Hackensack Volunteer Ambulance Corps, Inc.
EMIL JOHN YANNETTI, 88, born June 15, 1925, of South Hackensack, NJ and Holiday, FL passed away on March 29, 2014 at home. Emil was predeceased by his loving wife of 61 years, Gertrude (Sue). He is survived by his three children Edna (Jeff) McConnell, Susan Yannetti and Thomas (Dorothy) Yannetti. His nine Grandchildren, Teresa Dean, Julia San Pietro, John Hynes, Lisa Pedzick , Gary Yannetti, Brittany Yannetti, Thomas Yannetti, Steven McConnell and Christopher McConnell. His ten Great Grandchildren, Christina, Shane, Ariel, William, Jillian, Jared, Joseph, Richard, Alexander and Victor. Emil was a retired Police Captain of the South Hackensack Police department. He spent his life giving to the community and belonged to many service organizations. He was one of the founders, Captain and a life member of both the South Hackensack and Hackensack Volunteer Ambulance Corps, an officer in the New Jersey State First Aid Council 24th district, a past South Hackensack Fire Chief, American Red Cross Disaster Chairman, New Jersey Police Honor Legion, NJ Police PBA, NJ State retired Police-Florida Local #22 and was instrumental in bringing the paramedic program to Hackensack. He continued his service after retirement in FL as a Trustee in the NPR Elks, Vice President of the South Coast Bingo Council, Father Farrell Knights of Columbus 4th Degree and Grand Knight. He was an usher at St. Vincent de Paul church for many years. Emil served in the US Army during World War II in the 3rd Division-Combat Engineers under General George Patton. He was wounded two times and received combat medals for saving a young Polish girl and a Purple Heart for his wounds. It was during his time in Salzburg, Austria that he met and married his wife Gertrude (Sue). His greatest gift to his family was instilling the value of giving back to the community. His children and many of the younger generation follow his lead. 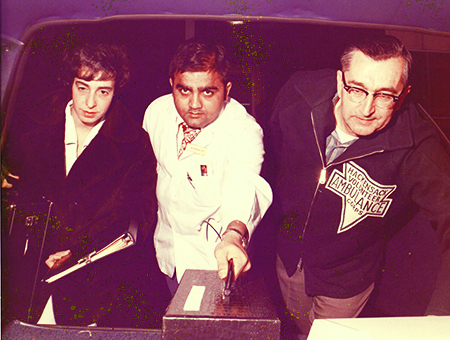 Emil Yannetti (right) in 1974 with the Heart Rescue Team, precursor to today’s paramedics. The memorial service for Emil and Gertrude (Sue) will be held on Sunday, April 13, 2014 from 5:00-8:00PM at G. Thomas Gentile Funeral Service, 397 Union Street, Hackensack, NJ 07601. A Prayer Service will be held Monday 10:00AM at the funeral home with burial following at St. Joseph’s Cemetery in Hackensack. In lieu of flowers, donations to the NJ First Aid Council 24th District Emil John Yannetti Scholarship fund c/o Chuck Parodi, 48 W Grove Ave, Maywood, N.J. 07607 would be greatly appreciated.